Thiruvananthapuram, the southernmost district of Kerala is home to its capital, Thiruvananthapuram, or Trivandrum as it is commonly known. The largest city of the state, it is home to around 1 million people, with the district seeing a 3 fold increase in the number of vehicles since 1990-91. Two-wheelers account for over 60% of all vehicles in the city, with over 100 new vehicles registered in the district each day. Riding a two-wheeler without a valid insurance attracts a penalty in the city, with the government making it mandatory for all vehicles to be insured. The district stood second in terms of the number of accidents recorded in the state. Kerala registered a total of 29,963 two-wheeler accidents in 2015, with a number of these resulting in loss of life. Given these figures, a good two-wheeler insurance policy is a must to offset any financial losses. Use the official website of the insurance company to locate a network garage. This involves entering the pin/area code. Contact company care representatives of the insurer and ask them to provide a list of network garages in the area. Use the mobile app of the insurer (if available) and search for a network garage. Utilise the services of third-party websites which are equipped to provide a list of network garages of a particular insurer. One can approach an agent and ask him/her to provide details of network garages in a city. Hassle-free – One needn’t run around searching for a garage. The whole procedure is simple, efficient, and quick. The policyholder is expected to inform the insurer about his/her requirement, with the insurer handling all communication with the garage. Professional – Network garages are more professional when compared to local garages. They hire expert technicians and mechanics who can diagnose and solve problems. Additionally, one can expect the vehicle to be fixed and delivered on time. Minimal documentation – One needn’t submit a plethora of documents to utilise the services of a network garage. Quality products – Network garages will use quality spare parts to fix any damage. This is in contrast to local garages, who can use second-hand spare parts. This reduces the chance of future damage to the vehicle. Reduced spending – A policyholder need not pay an exorbitant amount to get the bike fixed. The insurer will handle the amount directly. The only time one would need to pay an amount is if the cost of repair exceeds the cost of cover. 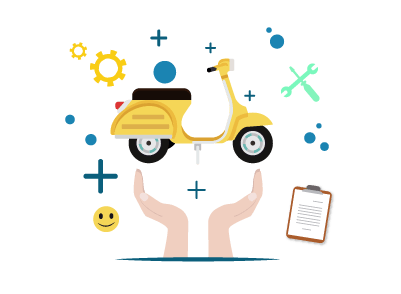 Additional services – It is possible to get additional services like roadside assistance, towing, doorstep delivery of vehicle, etc. Replacement vehicle – Certain insurance companies provide an alternative mode of transport while the insured vehicle gets fixed at a network garage. With a plethora of options available today, it is imperative that one choose a policy which matches their needs. As such, one should keep the following points in mind. Policy term – Insurance companies offer policies with a term of either 1 year or 3 years. One should select the policy based on his/her needs. Choosing a longer tenure reduces the need to renew the policy periodically, in addition to such policies being cheaper. Type of cover – There are two options when it comes to cover – liability-only and comprehensive. Choosing a comprehensive cover can be a good decision for it provides additional protection. A liability-only policy provides protection only in case of third-party liabilities. Claim settlement options – There are two options when it comes to claim settlement – reimbursement and cashless. Cashless policies can be a smart option, primarily for those who do not wish to get involved in documentation and procedures. Reimbursement policies can be time-consuming. Premium – Ensure that the premium for the policy is affordable. One should compare policies to find one which meets one’s budget. Insurance companies offer discounts to individuals who have a good history of using their vehicle. Individuals with a No Claim Bonus are entitled to special rates on the premium. A few determining factors when it comes to premium include the age of the vehicle, engine capacity, accident history, etc. Exclusions – Check all the exclusions under the policy. Reading and understanding the terms and conditions is a must before purchasing the policy. Network garages – Choose an insurance company which has network garages across the country, with a good number of these located in the city of use. Deductible – Choosing a higher deductible can reduce the premium, albeit it increases the chance of out-of-pocket spending. The premium amount is inversely proportional to the deductible. Individuals who purchase a bike which is registered in a different state are expected to transfer not just the ownership of the vehicle, but also the insurance policy. Failing to transfer this can result in the insurance company denying a claim in the future. Individuals who have transferred ownership of the vehicle can transfer the insurance policy to the buyer by following these simple steps. Inform the insurer once the bike has been sold. Provide details of sale to the insurer. This includes documents like the sales deed, registration certificate, NOC from the RTO, etc. The buyer should meet the eligibility criteria for the policy. The fee should be paid (if any). Once the insurer has verified the documents they will transfer the policy.